I began the interview by asking joint questions to both Kim and Martin. Leslie: How did your interest in folk music and words begin, grow and develop? Kim: I didn’t come from a musical family and was always poor at music at school where a great emphasis was placed on being able to read music, rather than appreciating it. I’ve always been passionate about stories and poetry and, for me, it was the stories about people that pulled me in and the music came second. Now I’d say that’s changed and a chord can bring tears to my eyes just as easily as lyrics can. Martin’s always played guitar since we met and, as his interest in folk flourished, I became involved hearing him play at home and when he bought an old copy of ‘The Penguin Book of English Folk Songs’, I connected with these songs that had been collected from ordinary people warbling along at their garden gates. Martin: My background was in rock and pop, I’d been in bands since I was fifteen. Around 2001-2 I became a house-husband to our youngest daughter. With a little more down-time, and with the help and guidance of a friend I began to play acoustic guitar again. In this sphere of music it was more the singer-songwriter genre which interested me. However I discovered these wonderful, rich stories in traditional British music, and seemed to be able to marry the two strands of music together and off I went. Leslie: How does that interest express itself for each of you now? 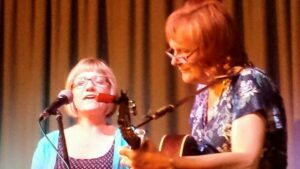 Kim: Now I sing in a duo called Warp and Weft with Alison Raymond – we do our own arrangement s of traditional songs and Alison writes her own too. I have written a few songs myself but I have a full on day job which occupies most of my headspace. I think I will come back to writing but, for now, I am happy as I am. We enjoy playing in and around the local area because we love the songs so much. Martin: For a while I sang and played in Warp and Weft and enjoyed it very much. However I have always been a writer of my own material, and wanted to put my own spin on the folk tradition. Now I write very much about the world I see around me, and its effect on ordinary people. I see this as the continuation of the folk process ever-evolving and changing. Leslie: For both of you, who are your main influences? Kim: My favourite band growing up was The Jam – I liked them for their anger, energy and social comment and I can see all those things in folk too. I also love the wordiness of Kirsty MacColl’s songs because it’s usually the words and the story that grab me first. 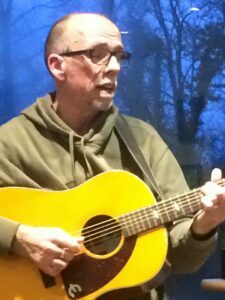 As I got into folk I particularly connected with the folk singer Bella Hardy – maybe because she comes from the Peak District which is a favourite place of mine and maybe because most of her songs are about real people and real places. Martin: For me it was and will always be The Beatles. The timeless song-writing brilliance of Lennon and McCartney. I think that sustained excellence, that was both commercial yet innovative, still has the power to thrill and amaze me. ‘Eleanor Rigby’ is a sublime piece of folk music. Leslie, to Kim: How do you work as a duo with Alison Raymond? Who writes the music, the words (or adapts the traditional songs) and what roles do you take up both in preparation and performance? Leslie, to Kim: What personal experiences inspire your songs? How do you adapt personal experience into music? Leslie to Kim: What is the connection between your interest in English authors/poets and your music? Has music helped you as a teacher? Kim: I suppose I love the pattern of the words and the way an old phrase can resonate with you even though it was written hundreds of years ago about a different situation. When you sing a song sometimes people come up afterwards and say how they related to it; even if it’s not one of our own songs it’s lovely to make that kind of connection. As a teacher I play music as the children draw and write and it’s remarkable how calming it can be – Martin got me on to Brian Eno’s ‘Music for Airports’ which I use a lot as background ambience. Leslie to Martin: How has literature influenced your music? Martin: In music I love the economy of language, of making every word count when composing a song. Poems and short stories, novellas etc. were always a starting point for me. Then you get the marriage with music. My literature influences would be Dickens and Lear, put guitars in their hands and they might have made excellent songwriters. I teach music and I love how children approach music and critique it. You can’t fool a child, they tell you exactly what they think. Leslie to Martin: Can you give examples of folk language you’ve researched for use in your songs? Martin: I love everyday expressions and some from yesteryear that we sometimes use in our day to day lives. One of my songs is titled ‘The world and his wife’. It’s a wonderful phrase and for me conjures some wonderful images. Another song uses the saying, ‘fur coat no knickers’, terribly judgemental but there’s a typically British comedic touch to it. The research comes from a liking of different regional dialects. I hope we never lose them. While they’re still there I’ll use them and incorporate them into my work. Leslie to Martin: What’s special about these examples of folk language for you and for your audience? Martin: Well we’re a wonderful country for all our faults. We are also an old country with a long and complicated history. I am still finding things out about this country that I call home. Part of my job is collecting this information and reporting it to anyone who will listen. People hopefully choose to listen and be entertained. Leslie to Martin: Can you describe your personal process of composing lyrics, please? How do you know when they’re good? Martin: It usually starts with a phrase, which more often becomes a title, or at least a working one. I always think in terms of structure (verse, chorus, middle eight). I try not to be too ‘wordy’. I work with random phrases sometimes using nonsense ‘place holder’ ones where I don’t as yet have one. The words have to have a flow and metre. The verses have to have a strong and intriguing narrative. I always look at different ways to say things. Choruses have to have that hook, trip off the tongue, have depth but be memorable. If I can remember them the next day, it’s good and will be the one I use. Leslie: For both of you – how has illness affected and become part of what you express through your creative work? 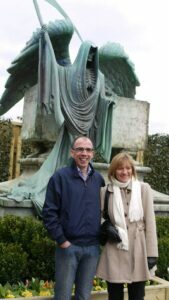 Kim: I thought having extended time off work recently might give me that headspace I was craving – it turns out I was so busy getting physically better that all my energies went into that. Thinking about it, most of the songs I’ve written have come when I wasn’t even thinking of song writing. They started as little seeds which I noted down and then set aside for a while. Sitting down to write doesn’t work for me and I end up overthinking. Martin; Luckily this has not been an issue for me so far. The only area has been with some mild depression issues. Thankfully music has always been there. I believe it has healing qualities and pulled me through some uncomfortable moments. Leslie: How has music helped both of you in your lives? Kim: It’s given us a shared interest and a great group of friends. 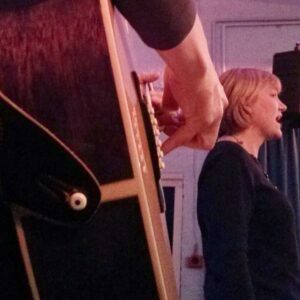 Most of our social life now revolves around the folk club at The Pump House in Watford and the summer brings lots of performance opportunities. People often ask me how I fit music in around my job but I don’t think I could do my job without having the me-time and us-time that music brings. Martin: It’s always given me a focus and of course enjoyment. I was a solitary child with a love of language, poetry but also comedy and the absurd. I’ve always looked at things in the abstract and non-linear. First the music of the Beatles and then the youth explosion of punk (circa 1976-79) were both life-changing and set me on a path, a musical path. Next week, in MICHELLE PAYETTE-DAOUST ON CREATIVITY, Canadian blogger, bi-linguist and teacher Michelle Payette-Daoust writes about creativity. I am also very moved by music, Leslie. I see lyrics as poems set to music. I find listening to music very uplifting to my mood and spirit. The comments in this post really resonate with me. Thanks, Robbie. Yes, lyrical meaning song. I find poetry close to music, so the sound is more important than prose and modifies the meaning.